Having Autism is tough as it is already because you may come across many people who do not understand or care about you. You may often be made fun of because of the way you look, walk or anything you do or say. It’s a continuous battle that I deal with every day and unfortunately there exists people who will talk and make fun of you no matter what. Know that you are not alone. I have 2 simple idea on how to enhance your emotional intelligence (or Emotional Quotient, EQ) to counteract this negative feedback and restore your mind with positive thoughts. As has previously been discussed on Aspergers101, emotional intelligence is a crucial skill to learn and practice that can greatly benefit you in many areas of your life. But how exactly do we get there? The steps below should help guide you towards building your emotional intelligence and self-awareness. How can we enhance our emotional intelligence (EQ)? A gut feeling you have about a particular situation such as quitting your job is a sign that something is not right either about the situation, or something is not right about quitting your job. If your body gives you an alert signal about a certain situation, pay heed because it may save you from a dangerous outcome. Listening to these signals and the root feelings of the sensations in your body will process your power of reason. From a score of 0-10, with 10 being the best and most positive and 0 being the lowest and least confident, write it down in a journal to record how you feel each day overall. If you’re having a bad day, examine how or what caused you to feel this. Explore what transpired that day that made you feel down and how it connects with your overall feelings. 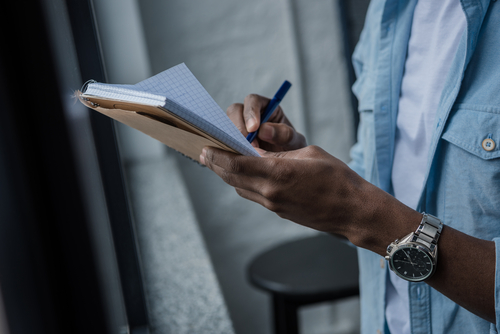 Just as the previous step, writing things down and reflecting on them later will allow you to see how you felt that day and what the stressors were that made you feel a certain way. This way you can be more knowledgeable about your emotional responses in the future. Strong emotional intelligence leads to feelings of control and self-awareness that are incredibly important in the most difficult moments. Many studies have shown that writing down your thoughts and feelings are incredibly important. This is especially true for men, as is discussed in this article, “Why men should keep a journal“, who are not often taught this skill or have unfortunately learned from society that journaling is feminine and therefore undesirable. On top of this, men make up a large percentage of the ASD population, as autism.org explains: studies range on the men/women ratio of diagnosis from 2:1 to 16:1. Because of this it is truly important to focus on learning skills that can help young ASD men overcome the emotional barriers placed in front of them from multiple places. There is a time to stop looking and pondering over bad feelings and thoughts and learn how to shift. It is important to only look back at past feeling and thoughts for a short period of time. This way you can see what caused you to become stressed, sad or angry and avoid those persons, places or things. But it is equally important that you do not wallow in these past feelings and events. Focusing too much on the negative is counterproductive and can lead you to hopelessness. There is an easy balance to find where you examine your emotions without getting bogged down in them. For more on this, read “How to Silence Negative Thinking” from The Guardian. This exercise will work overtime to build your EQ. People with high EQ have the ability to bounce back emotionally. When having a bad thought or feeling your EQ can help you to remain positive. The 3 R’s to restore the mind with good thoughts and build emotional intelligence. Replace/Restore: Replace bad thoughts and feelings in your mind and restore them with positive ones. Throw out bad feelings and watch them pass by out of your mind like a passing car. At the same time, allow good thoughts to flow in and run rampant through your mind. Repeat: You will always have negative thoughts and interactions that bring you down. Raising your EQ and working on self-awareness does not mean that you will never encounter a bad thought or situation. It is important to recognize this and repeat these processes every time you have a bad thought or feeling. This is now a tool in your mental toolbox! My brother told me that I would never amount to anything. I recognized that bad thought and I replaced it by saying, “I am worthy”. I repeated that thought in my head over and over. Then, I put the words on a note on my wall by my mirror so that I can see it every day. Keep being different and unique because it sets you apart and makes you special. My 12 year old son has Asperger and I think this was wrote for him ! Thanks for the article. I am trained in psychotherapy as well as Developmental Disabilities including Autism. My son, Bryan Anderson, MSW, LCSW, CAMF has just published a book designed for autistic children with explosive anger, Grab The Wheel Kids. I am impressed with this article and request that you visit our website http://www.andersonservices.com and consider linking with us both on linked in.